Thyme for Cooking Dinner tonight: Grilled Pork Tenderloin with Mustard Seeds. 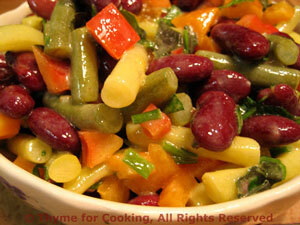 We finished the Three Bean Salad with this dinner, making it an easy night for the cook. This is fun to cook on the barbecue grill: all the mustard seeds pop as they get hot. The rub makes the tenderloin rather black, but not too spicy. The sauce helps keep it moist. Remember, slightly pink is perfect! Mix paprika, mustard seeds and garlic powder. 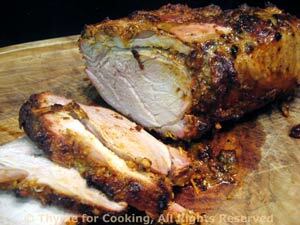 Rub olive oil all over pork then add dry rub and press into pork. Cook on barbecue grill or in 400F oven for 25 - 30 minutes. Turn occasionally to brown on all sides. Mix mustard, vinegar, oil, and use to baste pork after 15 minutes. Baste 2 - 3 times. When you think pork is done, (it should feel fairly firm but not totally stiff when you pick it up) slice into the middle to check. It will be moist when not overcooked. When done to your taste, slice and serve. The grated, fresh tomato adds more of the scent of tomato than a heavy flavor, making healthy, brown rice a bit more interesting. 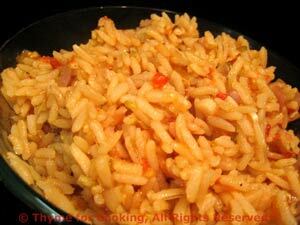 You could substitute Basmati. Finely chop onion and mince garlic. Heat oil in small saucepan. Add onion and sauté 2 minutes. Add garlic and rice and sauté 1 minute. Measure the grated tomato. It should be between 1/3 and 1/2 cup. Add enough chicken stock to equal 1 cup (8oz, 240ml)and add to rice along with 2 tbs water and oregano. Cover, reduce heat and simmer until rice is done (package directions) 15 - 20 minutes. Uncover, fluff with a fork and serve. Note: To grate tomato: Cup half of a tomato in your hand and rub it on the big holes of a box (or other style) grater until all that is left in your hand is the skin. You'll have to press a bit, but not too hard. Be careful not to grate your hand.